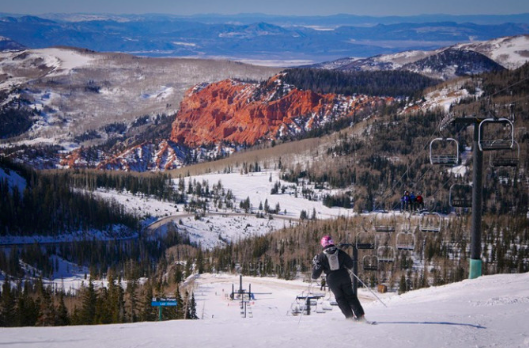 Brian Head is Utah’s southernmost ski resort. But its base elevation is the highest. At 9600’, the bottom of Brian Head is higher than the top of Deer Valley. It took about a day before I got acclimated. 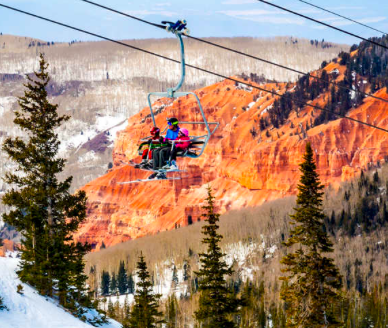 In terms of Utah ski resorts, Brian Head is relatively small: 650 acres and a 1320’ vertical. It’s possible to add another 300’, but that would require a steep out-of-bounds climb. Because of its location, Brian Head can be a snow magnet, especially when southern storms are prevalent. I skied the resort after a modest but windy storm. Every now and then the clouds lifted to reveal glimpses of the dramatic red rock countryside. On a bluebird day, the views must be magnificent. The resort got going in the mid-60s when Alta’s Alf Engen was invited down by the first of several owners to help lay out the trail system. The place has developed significantly over the years. Getting from parking lot to lifts is effortless. We only visited Giant Steps Lodge where we booted up in the lower level (coin-operated lockers available for storage) but needed to exit and walk a short slope to get to cafeteria and restrooms…a minor detail unless you have the urge. Senior pricing is good: If you’re 65+, weekday tickets are $30; weekend tickets are $43. Holidays, the price climbs to $57. Season passes are available to 62-69 year olds for $329; 70+ for $219. Season pass holders also get three days at each of 15 other smallish areas in Arizona, California, Colorado, Idaho, Michigan, New Mexico, Utah, and Wyoming. It might be worth the purchase for that benefit alone! Another Brian Head price advantage is the low cost of its ski school. A weekend lesson is $75. The resort has other attractive instructional offerings as well. Lodging options are limited to two hotels and a whole lot of condos. We stayed in a pleasant one bedroom in one of the hotels, Cedar Breaks Lodge. It has underground parking and easy elevator access to all floors. The first night we ordered pizza and wings in its restaurant. All I can report is that the beer was good and the hamburgers delivered to other guests looked edible. The other hotel is the Best Western Premier. It’s nice looking, serves a respectable sit-down breakfast, and features a basic-menu steakhouse. Other than the day lodges there are only two non-hotel restaurants: Pizanos Pizzeria (which we didn’t try) and Sook Jai Thai Cuisine, a Thai home-kitchen with acceptable dishes and a lack of central heating. Contemplating a stay of more than a few days? Investigate the many condo offerings and stock up on food in Parowan (at the bottom of the 13 mile access canyon) or in the larger community of Cedar City, 32 miles away. Brian Head is a 3-hour drive, from Las Vegas, where winter flights often cost less than flying in and out of Salt Lake City, 4½-hours north. The resort would pair well with a visit to Vegas or one to nearby Zion National Park and/or Bryce Canyon National Park. If I wanted a laid-back, inexpensive, Western ski vacation, perhaps with grandkids learning to ski or board, I’d look into the southern comfort of Brian Head. For Brian Head Trail Map Click Here. For Brian Head Giant Steps Webcam Click Here.